BEIRUT ― A military bases race is underway between Russia and the U.S. as each nation seeks to expand its presence in Syria and counter asymmetric threats. 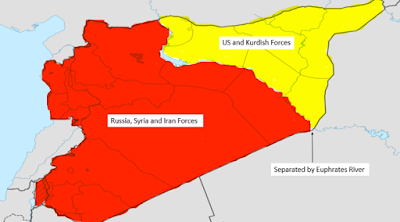 The U.S. has a military presence in several key locations, but there are two areas with heavy U.S. troop presence that are being transformed to military bases, according to a military source: The first is located in Al Tabaqah near Al Raqqa north Syria, where the U.S. special forces troops are training Kurdish groups; the other is constructed in Al-Tanf where the U.S. troops prevent Syrian and Russian armed forces from crossing. WNU Editor: Both Russia and the U.S. want to stay in Syria, but their objectives are different .... Russia to have an airbase in the Middle East and a naval base on the Mediterranean, and the U.S. to stop Iranian plans to have a land route from Iran to their Hezbollah and Syrian allies. But while the Russian bases does expose their soldiers to symmetric threats .... the U.S. presence is in the heart of Kurdish and Syrian rebels strongholds who have no love for the Syrian government and its allies. But of the two .... the U.S. is diplomatically in a more difficult place. The Syrian government wants the U.S. out, and for many countries the Assad regime is the legitimate government of Syria.